In October 1940 Nazis forced all the Jews in the Polish city of Warsaw to live in the cramped squalor of a small ghetto. Despite the starvation and disease that claimed 50,000 lives per year, the Jews were not dying swiftly enough to suit Heinrich Himmler, who ordered in 1942 that the Warsaw Ghetto be dismantled and the 450,000 inhabitants be deported to the gas chambers at Treblinka. On April 19, 1943, the first day of Passover, two thousand German troops, singing confidently, marched into the ghetto to round up the remnant of remaining Jews. Suddenly, a fifteen-year-old girl tossed a grenade in their midst. Within minutes the German army had been routed. 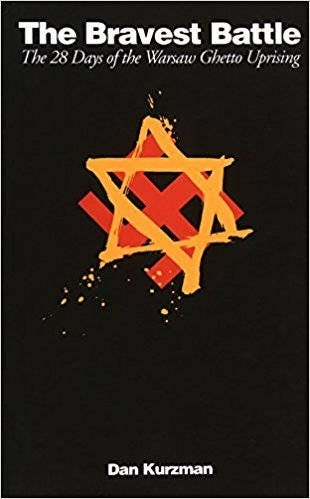 The Warsaw Ghetto Uprising had begin.This is the first full-scale, step-by-step account of the climatic twenty-eight-day struggle of the poorly armed Jews against their Nazi exterminators. The Bravest Battle took more than two years to write and involved interviewing more than 500 people, including most of the surviving fighters. This moving history cannot be matched for its authenticity and drama. The Bravest Battle is a testament to the Warsaw Jews, who fought for survival with dignity and courage.